Big Data and IoT (Internet of Things) technologies are powerful tools to enhance the knowledge about activities and behavior of tourists in frequently visited areas of the city. The information collected can be used to improve the management of the flow of visitors and to assist in decision making related to public services at the city council level. However, the purpose of using these tools is to transform the knowledge they provide into tangible benefits for both local residents and visitors. Barcelona has become one of the most popular tourist destinations in Europe and every year the number of visitors is growing. As a result, many urban challenges have arisen and they need to be managed in order to minimize the possible negative impact of tourism on the city and its citizens as well as to enhance and distribute its benefits beyond the areas closer to touristic attractions. This project focuses on how IoT & Big Data technologies can improve all activities of management, decision making and planning related to tourism undertaken by the local authorities. 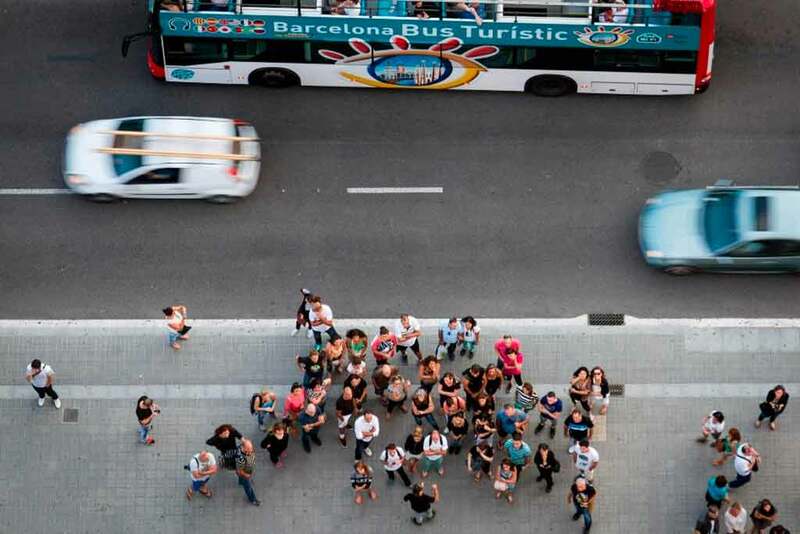 The use case analyses visitors´mobility patterns on the high interest area of Sagrada Familia. most popular routs between neighbourhoods in Barcelona. Mobile phone data were very useful for measuring, detecting and quantifying people in areas of interest in the city. 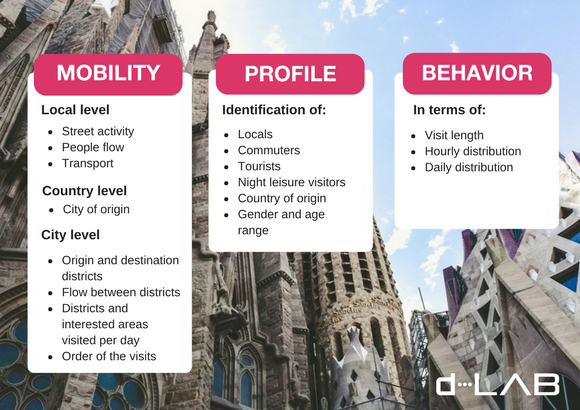 They´ve complemented well demographic and tourist information obtained through surveys and allowed the definition of mobility patterns between districts. However, reducing geographical scope in the second phase, required the deployment of IoT elements to define micro-analysis at the street level. Phase 1 helped in defining data analysis methodology that was further applied in the use case of Sagrada Familia. The area of the Sagrada Familia is one of the city´s areas that concentrates more tourists and excursionists who visit the temple admiring the city’s modernist architecture. 3 3D sensors – to count people entering and exiting from different metro stations. The information collected in this phase is much more detailed and the analysis of the data provided more accurate overview of visitors and their behaviour in the Sagrada Familia area. Big Data and IoT became a fundamental tool for the touristic management in the city. Optimization of mobility and better organization of affected areas, public services efficiency and better coordination with tourism site operators. Management improvement: accurate information for city planners, efficiency in public services coordination and setting the agents operations in the area, innovation and business opportunities, enhancement of the evaluation and adjustment measures deployed to minimize impacts. Tailor made suggestions according to the visitors profile, interests, timetable, budget, family, etc. Relevant context information: real time notifications, suggestions and advices. Loyalty: new touristic proposals, continuous improvement, positioning, gamification, augmented reality.